This article is about the historic Italian 185th Airborne Division Folgore. For the Italian Cold War mechanized division, see Folgore Mechanized Division. For the active Italian Army airborne brigade, see Folgore Parachute Brigade. 185th Airborne Division Folgore or 185ª Divisione Paracadutisti Folgore was a Parachute Division of the Italian Army (in Italian Regio Esercito) during World War II. Each Parachute Infantry Battalion fielded one Headquarters and three Parachute Infantry Companies. Each Parachute Artillery Group fielded one Headquarters and two Parachute Artillery Batteries armed with 47/32 M35 cannons. The VIII Parachute Engineer Battalion fielded one Headquarters and three Parachute Engineer Companies. The Division was well equipped with modern automatic weapons (Beretta submachine gun, Breda M37 and Breda M38 heavy machine guns) and many support weapons, giving the paratroopers of the division a good firepower against infantry and light tanks, but without any transports or medium and heavy artillery. After the cancellation of the invasion of Malta the division was sent to the North African theater. However it left the 1st Parachute Infantry Regiment with one battalion in Italy as foundation for the 184th Airborne Division Nembo. In June 1942 the divisions name was changed to 185th Airborne Division Folgore and its regiments renumbered and renamed as well. In North Africa the division participated in the Battles of El Alamein, where the division was the protagonist of a strong resistance against the attacking Commonwealth forces, managing also to drive off some attacks conducted by tanks and heavy infantry. 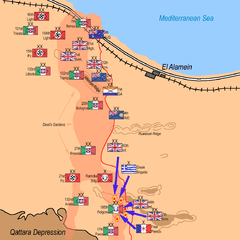 In the course of the Second Battle of El Alamein the division was almost completely destroyed. During the Second battle of El Alamein the Folgore Division was under attack from three British divisions 44th (Home Counties) Infantry Division, 50th (Northumbrian) Infantry Division, 7th Armoured Division, and the 1st Free French Brigade. Operation Lightfoot launched on 24 October 1942, was designed to break through The weak Italian-held southern sector of the Alamein line where the Bologna, Brescia, Pavia and Folgore Divisions anchored the right flank. The British attack began with an artillery barrage, followed by an all out assault by the 7th Armoured and 44th Infantry divisions. However, all that was achieved at a high cost of life and equipment was a small salient, which was soon recaptured by the Folgore. In the following days between 25 October and 4 November, the 50th, 7th, 44th divisions, 1st and 2nd Free French and the Royal Hellenic Brigades, supported by artillery and armour, failed to break through in the southern sector. The Folgore used everything at their disposal including letting the enemy advance into a "cul-de-sac" and then launching a counterattack from all sides. They also used their 47mm Anti-tank guns from enfilade positions and Molotov cocktails to knock out the advancing tanks. In the initial British assault alone the Folgore had destroyed over 120 armoured vehicles, and inflicted over 600 casualties. On 6 November, after having exhausted all its ammunition, the remainder of the Division surrendered. The few survivors, who managed to withdraw, were reorganized into the 285 Folgore Parachute Battalion and fought in Tunisia, they surrendered to the British in 1943, but without having to show a white flag and without having to raise their hands while surrendering. The second Battle of El Alamein: 7th Armoured Division, 44th Infantry Division, 50th Infantry Division and Free French Brigade attack Folgore from three directions: 10:30pm October 25, 1942, until 3am October 26, 1942. At El-Alamein, throughout several engagements, the paratroopers were either able to drive back the attacks or, when the enemy had been successful in completely wiping out the first line of outposts, to reform again, usually counterattacking. In spite of the overwhelming numbers, the British made little headway against them, and in the end, the Folgore was ordered to fall back because the enemy obtained a breakthrough elsewhere. The reasons behind this limited victory of sorts are two: mines and "guts". The mines were of course an invaluable asset for the defense. Here the minefields were extensive, thick, and treacherous; furthermore, the mines were in multiple fields. They forced the attackers to move slowly and to stick to the bottlenecks of the cleared pathways, often under observed artillery fire. Whenever the exit of the cleared track was within reach of one of the short-ranged Italian 47mm AT guns, it was easy to block the attack, provided that the first tank or two were disabled. But the British had effective mine-clearing task forces, flail tanks (the Scorpions) and Valentine tanks, and heavy artillery barrages to move behind. All of their main attacks, in the end, came through the minefields. There, the outnumbered paratroops, after hours of artillery fire, counterattacked the infantry and close assaulted the tanks, with grenades and molotov cocktails. Notwithstanding the heavy casualties they suffered, and temporary British successes in occupying several positions in the first outpost line, they held their ground. The main British effort, of course, was in the northern part of the line of the "Battle of El Alamein". However, the four divisions attacking the Folgore positions in the south, had also been given breakthrough objectives, that they did not reach. The 7th Armoured Division had been ordered to spare their tanks, so their attacks were called off after the bloody fighting during the night of October 24: 31 British tanks were destroyed or disabled during that night alone. At the end of the battle of El Alamein, Harry Zinder of Time magazine noted that the Italians paratroopers fought better than had been expected, and commented that: In the south, the famed Folgore parachute division fought to the last round of ammunition. With a few survivors and some replacement, the 285º Battaglione Paracadutisti "Folgore", a battaillon-size unit commandeered by captain Lombardini, was formed, and participated to the defense of the Mareth Line in Tunisia in mid 1943, particularly at the Battle of Takrouna, where it was destroyed. On 25 September 1944 the Italian Co-Belligerent Army raised the Folgore Combat Group with soldiers and materiel from the disbanded 184th Airborne Division Nembo. 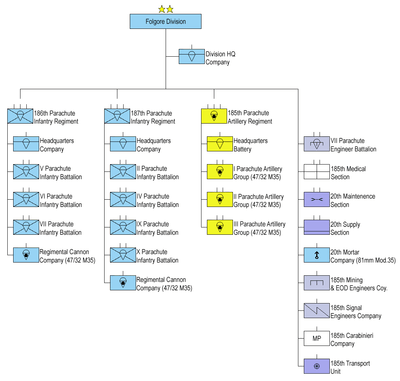 After the war the combat group became the Folgore Mechanized Division, which was disbanded on 31 October 1986. On 1 January 1963 the Italian Army raised the Folgore Parachute Brigade in Pisa. After the end of the Cold War the Italian Army decided to rename the battalions in its brigades as regiments for historical reasons. Therefore, the battalions in the Folgore Parachute Brigade were given the names of the regiments of the former 185th Airborne Division Folgore. 1 2 Wendal, Marcus. "Italian Army". Axis History. Archived from the original on 2009-05-03. Retrieved 2009-05-04. 1 2 Bennighof, Mike (2008). "185 Airborne Division". Avalanche Press. Archived from the original on 2009-05-03. Retrieved 2009-05-04. ↑ "American Historian Praises The Role Of The Folgore In North Africa". Archived from the original on 2009-09-30. Retrieved 2009-09-26. Quarrie, Bruce; Anderson, Duncan (2005). German Airborne Divisions: Mediterranean Theatre 1942 - 1945. Osprey Publishing. ISBN 1-84176-828-6.